Adventure Time Recap - "Lemonhope Pt. 1 & 2"
This week's Adventure Time brings us the epic saga of a young but reluctant hero destined for great things. Also, he's a lemon. Spoilers to follow. We open with a dream sequence, with Lemonhope as a cherub, leaving a monochrome bird's nest and flying through darkness, until he finally reaches a red door. He hears a knocking, only to wake up and find that it's time for school. We last saw Badlemonnohope (A.K.A. Lemonhope) in Too Old, where Princess Bubblegum and Finn found the young boy imprisoned, and broke him out. They managed to escape, with the help of the rest of Castle Lemongrab's citizens, but Lemongrab was very displeased, and wound up eating what remained of Lemongrab 2. Don't worry, though, he was still alive in there. In this episode, Princess Bubblegum shows Lemonhope a propaganda film released by Lemongrab. Conditions have never been great in Lemongrab, but things seem to have gotten… worse. The film (titled "Hello! And keep away from Castle Lemongrab!") paints a very bleak picture of the totalitarian city-state (Lemongrab actually calls it that) the Earldom of Lemongrab has become. We also find out that Lemongrab 2 is totally still alive… Inside of the Earldom's fat ruler. It seems that "since they've gotten rid of Hope," Lemongrab has gone even more completely power mad, and Lemongrab 2 reaches out of Lemongrab, screaming that Lemonhope needs to return to Castle Lemongrab and save the Earldom. The film ends, and Princess Bubblegum notices that Lemonhope hasn't been paying attention, instead doodling a picture of himself. She then tries to see how Lemonhope's empathy has been developing, giving him two cupcakes, and asking if he'll share one of them with Finn (oh, yeah, Finn's there too. He doesn't have much to do in this episode either, but that's fine, he takes up very little screentime and actually does things when he's on screen). Lemonhope licks his thumb, and sticks it in each cupcake, saying that Finn can get his own cupcakes. It seems that, while he's not completely off the rails, he's definitely still a part of the Lemon family. I want to take a brief sidebar here. Princess Bubblegum says that they need to take a more hands on approach, and sends Finn off, yelling at him to make sure he read his Geometry homework. Has… Has Finn been going to school this whole time? Granted, it's a one-off gag, but Adventure Time's one-off gags often have meaning, and while this seems like the first time I can think of that we've ever seen a classroom in Ooo, is it possible that Finn's being taught by Peebles? In any case, PB and Lemonhope travel to the outskirts of Castle Lemongrab, and we see that it now appears as an enormous prison. PB and Lemonhope use cloaking devices, since tensions have become heightened between the Candy Kingdom and Lemongrab, and new pacts and treaties prevent PB from getting very close to it. We see an escape attempt, as a random lemon flies over the walls, before a spotlight hits it, and it is picked up by a bird, and tossed into the center of the castle. "I AM GOING TO EAT YOOOOOU!!!" We hear Lemongrab scream. Then… Surprisingly disturbing screams of pain, which eventually turn into silence. "I DID IT!" Lemonhope is supposed to return to Castle Lemongrab and save them all someday, but he doesn't want to. Lemonhope wants nothing but freedom, and being told what to do, even if that means saving his people, infringes on that freedom. Princess Bubblegum tells him that attitude is unacceptable, but before she realizes her unfortunate choice of words, Lemonhope disappears, running away from her. We cut to an island surrounded by sand, where a (now naked) Lemonhope dances around with his harp and flute, finally free. He sings a short song, before finding a burning town, also on the island, which has just been pillaged by sand pirates. He sees the sand pirate ship leaving the dock, and decides that kind of ship must come with a lot of freedom, so he manages to stowaway. The cargo hold of the ship has tons of limes in it, which Lemonhope finds hilarious ("It takes all kinds, I guess!"). He plays the harp for some rats, which then form a blanket over him. He falls asleep, only to be awoken by the sound of something happening overhead. A box falls from a shelf as the ship sways, and hits him on the head. When he wakes up, the ship has wrecked, and there's no one to be seen for miles. We're treated to another dream sequence, this time with a "very free" Lemonhope-horse walking along, dragging a Lemongrab 2 behind him, who is begging him to stop and help. The Lemonhope-horse steps in some gum, only to find that it's a little Princess Bubblegum, who screams at him that he's UNACCCEPPTTAAAABLLLLLLEEEEEEE! 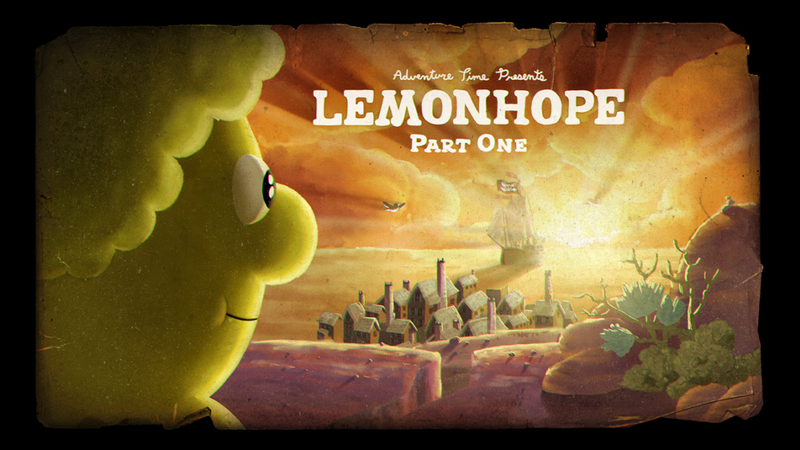 Back in the waking world, we see that Lemonhope is now disturbingly malnourished, having eaten dozens and dozens of limes. Clearly a significant amount of time has passed. He's run out of limes, so he decides that he has freedom to go find some water. There's a single cloud floating high above him, but it's not looking like rain. He journeys out into the desert. More time passes, and he's shriveled up, clearly on his last leg. He finally stops moving, and his head catches fire from the heat. Lemonhope is saved by a mysterious man who appears out of nowhere, and uses a cloud in a bottle to rehydrate Lemonhope. The man introduces himself as Phlannel Boxingday, who has been watching Lemonhope for some time from his floating cloud trawler. He thought it looked like Lemonhope could use some help, so he came down (why he didn't do that earlier… Anyone's guess). He says that Lemonhope is free to come join him for a while to make his journey easier. Or not. Lemonhope agrees, and the two take off. Before long though, the two find themselves beng chased by a Greedlard, a giant grey bird head monster thing. Imagine if Mr. Saturn from Earthbound were a bird monster. It's kinda like that. Lemonhope manages to charm the beast with his harp skills, and the two kill it by leading it straight into a rock pillar. Lemonhope screams when he sees other lemon-people falling out of the beast's mouth, and screams at Phlannel to stop the cloud. When they get to the ground, Phlannel shows him that it isn't people, it's just "dosh." Phlannel makes a living by killing Greedlards, and keeping their dosh for himself. He tells Lemonhope that he's free to join him and make things easier, and Lemonhope accepts. The third dream sequences is of a marionette Lemonhope being held up by metal chains. As he walks forward, he sees Lemongrab eating a cow. Lemongrab vomits more chains towards him, and the cow screams to run away, but Lemonhope is dragged toward Lemongrab, and when he falls and looks up to the sky, he sees himself as the one pulling the puppet strings. Lemonhope wakes up, and goes above deck. He tells Phlannel that he had another nightmare, and asks why he can't forget about his people. Phlannel tells him that while he is technically free to help the lemon people or leave them, he feels guilty about leaving them as they are. That makes him a prisoner in his mind. Lemonhope says that's what PB always told him, but that he never listened, and Phlannel says Lemonhope is a doer, not a listener, and had to learn with his hands. So, what we've got here are several parallels between Phlannel and PB from the beginning, and the fact that Phlannel only intervened when Lemonhope really was about to die. This leads me to wonder whether Phlannel was working for PB (or even was PB in disguise), and whether this whole adventure was the "hands on" learning experience PB mentioned toward the beginning. Plus, Phlannel is pink, PB is pink. Phlannel even parrots PB's sentiments from the beginning, and says that he can't help Lemonhope beyond taking him right to the outskirts of Castle Lemongrab (near where PB took him at the beginning), due to pacts and treaties. Think about it, is all I'm saying. Lemonhope manages to sneak into Castle Lemongrab, but is quickly confronted by Lemongrab. Lemongrab reveals that he has earplugs in, and that Lemonhope's plan to play the harp to defeat Lemongrab won't work. Lemongrab 2, still alive inside the fat Lemongrab's stomach, hears this, and reaches out of Lemongrab's mouth, pulling the earplugs out. As Lemongrab panics, Lemonhope plays his harp… and Lemongrab explodes. We get one more dream sequence, as the cherub Lemonhope from the start climbs stair steps (M.C. Escher style), before returning to the bird's nest the episode started in, now in color. Finn plays the flute as Princess Bubblegum sews up Lemongrab 1, saying that although he's pretty Frankenstein-ey right now, he should eventually go back to normal (as in "Too Young" style Lemongrab). PB asks Lemonhope if he'd like to stay in Castle Lemongrab as a champion, but he tells her that he really only came back so he could stop thinking about all of them, and that he'd come back when he was tired of being free. Maybe a thousand years or so. Princess Bubblegum and Finn are both shocked that Lemonhope decided to leave. PB says that she even had a song prepared to sing about Lemonhope staying, and Finn convinces her to sing it anyway. Bubblegum sings over the last scene of the episode. A very old Lemonhope walks through familiar areas. Finn and Jake's treehouse is now miles high, far above the clouds. We see a ruined city reminiscent of one from the great mushroom war, but on closer examination, it's a much more technologically advanced version of the Candy Kingdom. After walking through those ruins, he makes his way to Castle Lemongrab, which now looks… Exactly the same. He wanders through the old castle, to a room which PB had prepared for him, climbs into bed, and closes his eyes. Oh, geez, what didn't work this week? This is the kind of episode that makes me really love Adventure Time. It's unabashedly silly, but there's real emotional depth to the whole thing. Lemonhope's other episode, "Too Old," didn't really give him much of a personality, but he really gets a chance to shine here. He's given a distinct personality from the Lemongrabs, but he definitely still has some similarities to them. It's funny when it wants to be funny. It's dark when it wants to be dark. It's really disturbing when it wants to be disturbing. The second and third dream sequences especially are really uncomfortable, which is exactly the feeling anything Lemongrab related should have. By far my favorite part of this episode though was the last scene. As far as I can remember, this is the first time we've gotten hints at a cyclical nature to the world of Adventure Time. The past world, the world of Humans, got very advanced and then undid themselves, and now this hints at a similar fate for Ooo somewhere in the future. Now, we really don't know how long Lemonhope was gone for, it may have been a thousand years like he referenced while leaving, or it may have been ten thousand, either way we've now seen that the Candy Kingdom can't last forever. I really have very little to say against this episode. If I had to nitpick, perhaps I'd say that the first and last dream sequences seemed pointless, but even that really is a nitpick. Title cards taken from the Adventure Time wiki.